← ChezSylvia Weekend Adventure: Good Morning Manhattan! I have been paying Canton, NY a visit every now and then for work. It’s a tiny little town in the North Country. While it is a bit of a hike, whenever I find myself up there for a meeting, I make it a point to visit the Blackbird Cafe. It’s a small cafe that serves breakfast, lunch and dinner. The selection of sandwiches are all interesting, although I do question the use of their herbed mayo on almost everything. Don’t get me wrong, the mayo is delicious, but mayo in a grilled cheese was a little new to me. During my last visit, I had arrived early for a meeting (as we all know, the one who lives the farthest, is always the earliest), I took the time and grabbed some dinner. After I basically inhaled my sandwich while furiously checking emails from the past 7 hours, I suddenly had a little more time to kill, and a sweet tooth. So I perused the display and saw something called Hello Dolly. Intrigued I asked what it was. 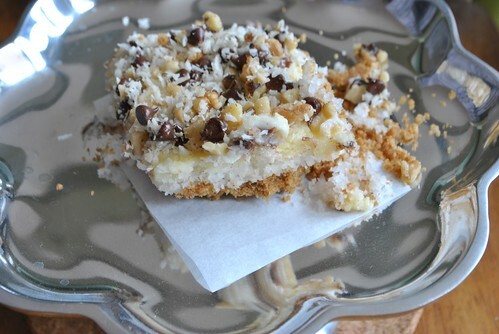 It was a graham cracker crust with coconut and topped with walnuts and chocolate chips. Sold. With the weather cooler and the AC now off finally, I decided it was time to get that oven running again. So, I decided to make a version of the Hello Dolly that would also help me use up a block of cream cheese I’ve had sitting in my fridge way longer than I would really like. I combined a couple of recipes, and used some baking experience to throw this version together. I apologize for the approximate measurements. I totally went old school grandma baking on this and did it mostly by feel than exact measurements. First preheat the oven to 375 degF. In a food processor, break up the graham crackers and pulse until they are crummy. 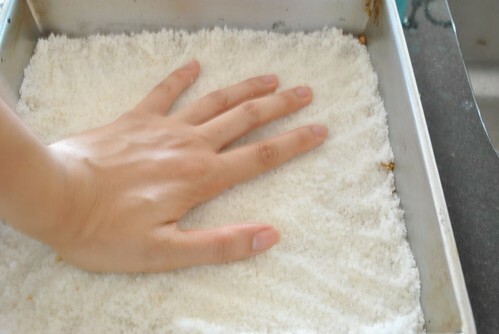 Transfer to a bowl and combine with the melted butter until it looks like wet clumpy sand. Pour into an 8×8 pan and press into the pan. Bake in the oven for 6-8 minutes till it sets. 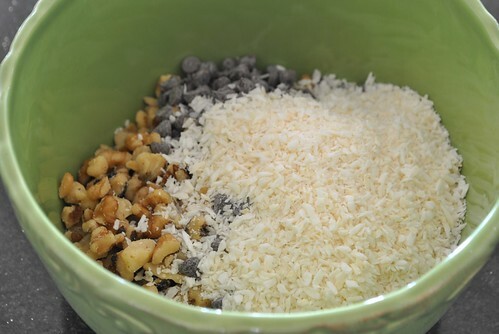 Meanwhile (you don’t have to wash out the bowl), pour in the coconut flakes and process until kinda creamy and clumps up when you squeeze it together. 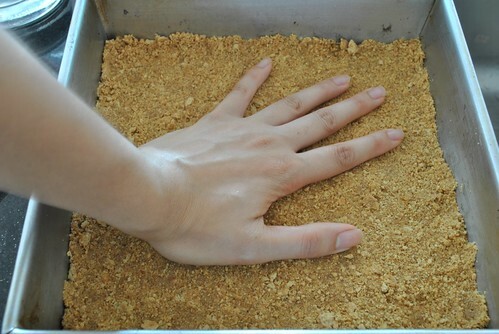 Once the crust is done, let it cool down a bit before pressing the coconut on top of the graham cracker crust. Lest you want to burn your wrists when you accidentally touch the edges of the pan (like I did…more than once). Reduce the oven to 325 degF. 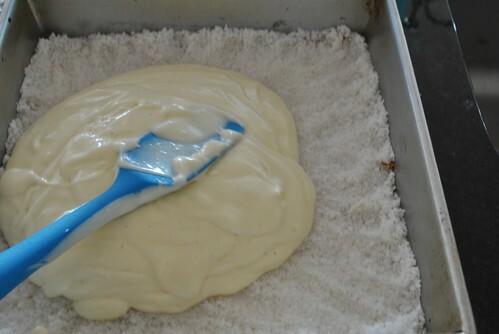 To make the cheesecake layer, in a mixer with the paddle attachement, mix the cream cheese with the sugar until creamy. Add in the egg, heavy cream and vanilla extract and mix until smooth. 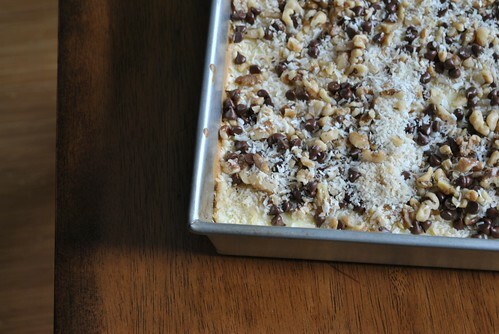 Pour the mixture over the coconut layer and then into the oven for about 30 minutes. 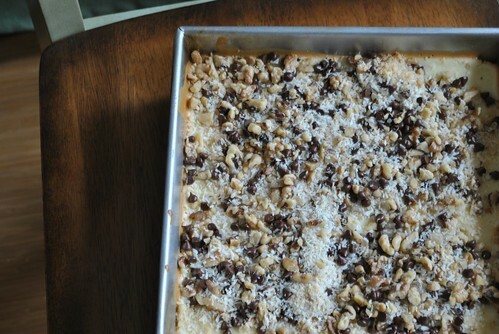 Make the topping by combining the chocolate, walnuts and unsweetened coconut flakes. When the cheesecake looks like it’ll be done within the next 5 minutes or so, pull it out of the oven and quickly sprinkle the topping evenly over the top and return to the oven. The bars are done when the center is set. Let the pan rest for about 30 minutes, then transfer to the fridge and let it cool the rest of the way, another 30 minutes at least. If you don’t let it cool before trying to cut into them, you will end up with a gloppy crumby mess. You have been warned! 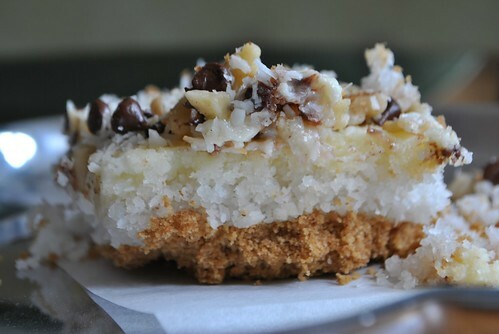 A lot of the sweetness in this bar is from the coconut layer, so exercise some restraint on the chocolate chips, and use unsweetened coconut for the topping. Yummy yummy! Inspiration comes from anything! Always keep your eyes open! 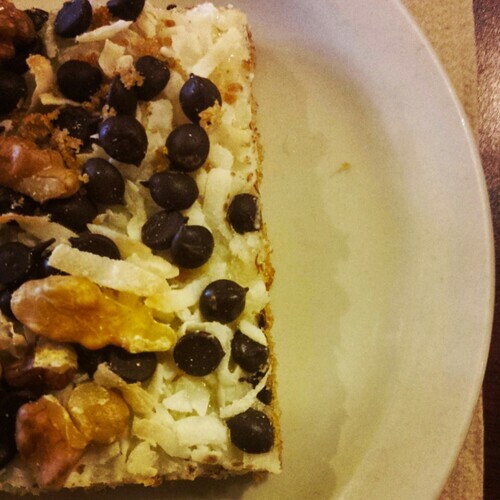 This entry was posted in Cookies, Dessert and tagged Blackbird Cafe, Canton, Cheesecake, Coconut, King Arthur Flour. Bookmark the permalink.